While a church records management policy can assist you in knowing which records to collect and means of collecting them, it should also take you to the heart of the matter. With so much corruption in the news of even Christian organizations, we need to make sure we are on the level with people. Consider the Apostle Paul’s words to the Corinthian Church in regard to the administration of the monetary gift they were giving to help the poor Christians in Jerusalem. Though these verses deal with financial management, they could, and should, also apply to our stewardship of church records. Even in financial or church records management, we should understand our priorities to do what we do as a means of showing love to God and others. If we maintain these motives, we will be both accountable and transparent. They were so intent on honoring the Lord and helping people that they went over and beyond what they needed to do. They didn’t take the easy or most convenient way. They put great thought into how they administered this stewardship so they were above reproach. If we take the attitude that God knows our heart and that’s all that matters, we could run into problems with the people we serve and possibly our testimony to the world around us. They do not see our heart. They might not understand why we are doing what we do. Yes, we are ultimately accountable to God, but we must also be transparent with one another if we want to have effective ministry with them. 1) Our transparency and accountability, or a lack thereof, affects people’s confidence and cooperation. If we can’t be honest with people about something as simple as record keeping, why should they have confidence in us in matters of even greater consequence? If we purposefully confuse or mislead people about what we are doing with the information they provide, why should they trust us when it comes to matters of the soul? 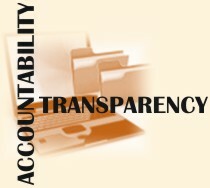 2) The need for transparency and accountability inspires us to do better. If we must be open with people about what we are doing and why, we will tend to be more accurate and detailed in our record-keeping so as not to leave room for discrepancy or distrust. Poor record keeping could raise unnecessary questions.